From Aristocrat’s Simple Slots Series (actually, no such series like that exists; we just made it up to excuse dozens of slot machines infused into the Aristocrat casino games catalogue with no real reason other than sheer numbers) comes the just-as-simply titled Geisha. Maybe we can establish some sort of rule: The odds that a slots game will be an uninspiring, no-frills lame waste of time increase exponentially when the game’s title is a single-word noun. 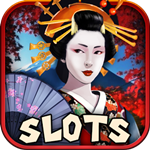 What are the symbols in the Geisha slots game? More evidence of a purely cookie-cutter game: A mishmash of generic symbols that make little sense when juxtaposed within a single collection. In the Geisha slots game, we’re given symbols including a dove (ah, yes, very much associated with geishas. Not. ), a fan, a golden dragon (Um, folks at Aristocrat? Yeah, the dragon is a traditional symbol of China, that big hunk of land in Asia directly across from the southern bit of the Japanese archipelago) and a decidedly unattractive geisha herself who, to her credit, is a wild who adds a 2x bonus multiplier to all wins. To accentuate the dullness and simultaneously remind us the the geisha were well-trained in the arts of poker, the A, K, Q, J, 10 and 9 symbols are also included. How much can I bet in the Geisha slots game? Any free spins in this game…? Somehow, the folks at Aristocrat at least managed to include such a feature so that Geisha isn’t an utter loss. In a typical manner, landing at least three scatters in a spin enters the player into a free spins bonus round. He/she wins five, 10 or 15 free spins for three, four or five scatters, respectively. On the plus side, the free spins are retriggerable with the landing of three more scatters during the spins. Is that it for the Geisha slots game? Yes, amazingly so. 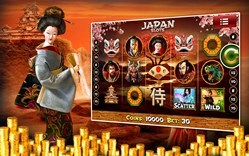 We suppose that the main draw to the Geisha slots game is archaeological in nature, i.e. it’s a trip back into the past. Not that gaming online should ever really take place in the past, but hey, we’re trying to put a positive spin (so to speak) on this thing. Can I play the Geisha slot game for free? Geez, why would you play this game for real money? No matter, both versions are playable from right here. Simply choose the game you like – lots of great slots games here, by the way – and click on it. The game window opens with an offer to choose between the two types of play. Either way offers unlimited play potentially, but neither requires a download to your PC or device! In the case of free play, we host all games. Otherwise, we’ll provide you with a high-speed quality-checked host of Geisha and (probably better) slots games!